Intel hasn’t had a lot of luck in entering the mobile market so far, primarily because its chips haven’t been that competitive, in any of the three main competition metrics: price, performance, power consumption. The rise of ultra low-end mobile devices is going to make it even harder for Intel to sell a lot of Atom chips, or make big profits on them. Intel Atom has held the performance leadership for many years (compared to ARM chips), ever since it was launched for netbooks. But while Atom has mostly stagnated in performance, in part because Intel didn’t want to make it “powerful enough for most people” (like what ARM chips are trying to achieve now), since Intel didn’t want it to undercut its Core chips, and in part because lowering power consumption was a big priority to get Atom to the ARM chips level of energy efficiency. The problem with that is that by the time they reached parity in power consumption with the best ARM chips out there, they lost the initial performance leadership they had over ARM chips. For example, an ARM Cortex A15 chip is up to 65% faster, at the same clock speed. 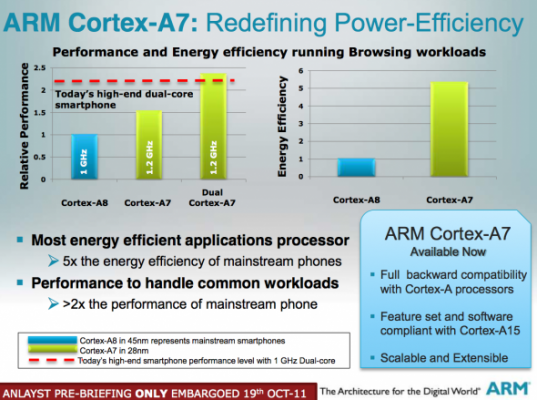 Plus, the Cortex A15 chips are already starting to arrive in quad core version (Nvidia Tegra 4, Samsung Exynos 5 Octa), while Intel won’t have a quad core Atom until the end of the year. The GPU performance of the latest Clover Trail Atom chip (which isn’t even for smartphones, only for tablets) is slower even compared to a one and a half year old Tegra 3 GPU. Intel wants to fix this, by adding Ivy Bridge graphics to the 22nm Atom chip they are going to launch by the end of the year. But don’t expect that GPU to be as powerful as the IVB GPU in laptops right now. 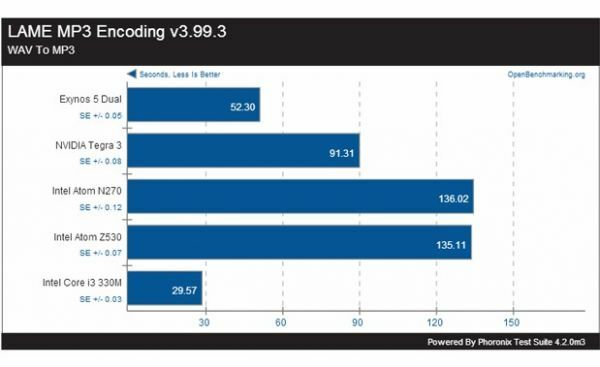 It should be 3-4x slower or more (it uses much fewer Intel HD 4000 cores than the laptop versions), which should put it behind chips like Nvidia Tegra 4, Samsung Exynos 5 Octa and Qualcomm Snapdragon S800. As I was saying in the previous article on why Intel’s decline is imminent, Intel’s biggest problem is not that they can’t catch up with ARM chips in performance and power consumption. They haven’t yet, and won’t for another year or two at least, but I do think it could be possible for them to catch up to ARM chips. However, it will be much harder for Intel to catch up with ARM chips in the price/performance metric in mobile. 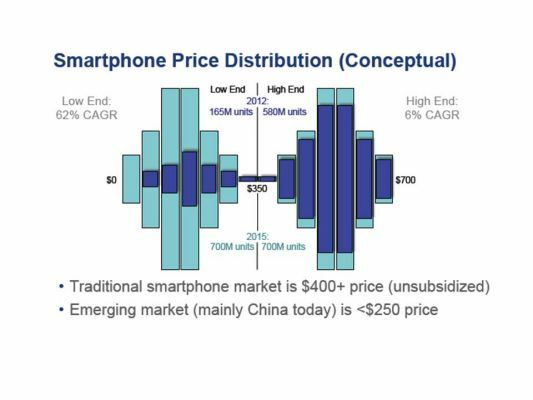 This is going to be most evident in the ultra low-end smartphone market, which is booming right now, because the potential there is billions of units being sold every year (by replacing all the feature phones of the past). Intel sort of has an answer for that, or at least they tried to address that market with Intel Atom Lexington. But that chip is not only a single core processor, which could slow down phones when trying to switch fast between tasks or panes, but it’s not even a true 1.2 Ghz core, as they’re claiming. That is the maximum Turbo Boost clock speed, that the phone will almost never reach, or if it does it will be for very short bursts of time. It won’t be able to do that for longer, because it will overheat otherwise. The performance has already been tested, and was found to be “maddeningly slow”. Why would any OEM choose Intel Atom Lexington over the quad core ARM Cortex A7 1.2 Ghz (actual clock speed) from Qualcomm, Mediatek or others, and for a lower price, too? The answer is that they won’t. 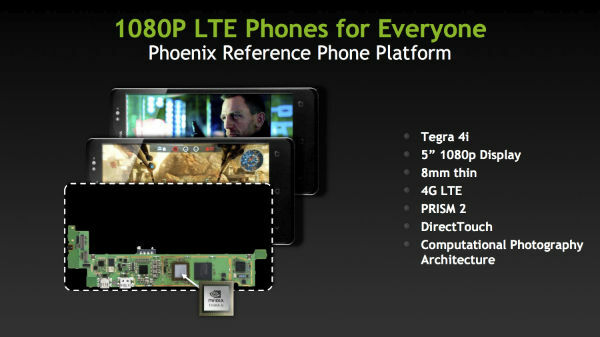 Plus, these chips are still only addressing the “low-end smartphone” market, not the “ultra low-end snartphone” one. For ultra low-end Android smartphones that only cost $50 or less, OEM’s are only going to need a single core Cortex A7 chip or even the same old ARM11 cores, that only cost several dollars right now. Even if Intel partners with a lot of OEM’s for this billion units market, and if their chips would be at least as powerful and energy efficient as ARM Cortex A7 (4x more efficient than Cortex A9 at the same process, so pretty hard to catch up to that anytime soon), Intel wouldn’t be making any real money from it. It’s the same reason why they’ve never wanted Atom to become powerful enough for normal laptops. They didn’t want to be in the business of selling $20-$40 chips. They tried that before with the Xscale ARM division, and they failed. Instead, they wanted to sell $200 chips. The several bucks chips market would be meaningless for their bottomline, and their profits, even if they somehow managed to own a big portion of it. At the high-end of the mobile market, Intel also has another problem this year. Virtually every big ARM chip maker will have LTE integrated SoC’s, but Intel won’t have one until 2014. This is becoming a stronger and stronger competitive advantage, and a major weakness for those who do not have it. In the US market, especially, no one can even launch a new phone without it having an integrated LTE. Even Samsung and Apple are using integrated modems from Qualcomm in their phones. Intel seems to remain two steps behind the competition, no matter what improvements they bring to their chips. But as I mentioned above, even if they do make Atom a chip can beat ARM chips from every single point of view (price, performance, power consumption, LTE integration, and more), they’ll still have the big problem of not making a whole lot of money from it, and that one is a hard one to crack. Intel is only improving Atom, and trying to enter the mobile market with it, in a defensive move, not because they think they can make a lot of money from it. The problem with that mentality is that it means they won’t prioritize Atom that much, over their other chips. Intel Atom won’t even be made at the 14nm process until the end of 2014, while their Intel Core Haswell chips will be using that process in only a few months. That’s a one year and a half delay for Atom. It’s clear that Intel isn’t willing the bet the company on Atom, precisely because no matter how popular it would become, it would still make them too little money, compared to their much more expensive Intel Core chips, and the rise of the ultra low-end smartphones and tablets, is only going to make it harder for them to compete or make money. Interesting that i’m reading this on an intel NUC box. I could have bought any number of mini android/semi linux boxes (raspberry pi, quad core units, ect) but i didn’t because i can do whatever the hell i want with intell, and i can’t say the same for arm. There will always be a market for people who will need x86 CPU’s and desktop GPU’s too, but the question is how large will that market will be 5 years from now? So far I don’t think Intel’s $400 NUC’s have been anything more than a tiny niche market with slow growth.